^ Czech language. Czech Republic – Official website. Ministry of Foreign Affairs of the Czech Republic. [14 November 2011]. ^ Czech Republic Population 2014. World Population Review. [14 April 2014]. ^ Population change – 1st – 2nd quarter of 2015. Czech Statistical Office. 21 March 2016 [21 March 2016]. ^ Census of Population and Housing 2011: Basic final results. Czech Statistical Office. Retrieved on 19 December 2012. ^ 5.0 5.1 5.2 5.3 Czech Republic. World Economic Outlook Database. International Monetary Fund (IMF). October 2016 [2017-01-15]. ^ Gini coefficient of equivalised disposable income (source: SILC). Eurostat Data Explorer. [4 December 2015]. 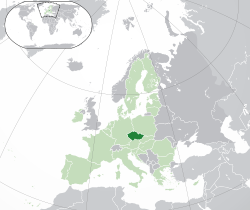 ^ Velinger, Jan. World Bank Marks Czech Republic's Graduation to 'Developed' Status. Radio Prague. 28 February 2006 [22 January 2007]. ^ 2018 Human Development Report. United Nations Development Programme. 2017 [23 March 2017]. ^ Stastny, Daniel. "Czech Economists on Economic Policy: A Survey", Econ Journal Watch 7: 275-287, Sept 2010. ^ Finance Ministry backtracks on joining the Euro by 2012. Radio Praha. [22 December 2008]. （原始内容存档于2009年2月7日）. ^ Czech Statistic Office. Czso.cz. [25 April 2010] （捷克语）. ^ První předběžné výsledky Sčítání lidu, domů a bytů 2011: Obyvatelstvo podle národnosti podle krajů 互联网档案馆的存檔，存档日期16 January 2013.. (PDF) . Retrieved on 12 August 2012. ^ The History and Origin of the Roma. Romove.radio.cz. [25 April 2010]. ^ Green, Peter S. British Immigration Aides Accused of Bias by Gypsies. New York Times. 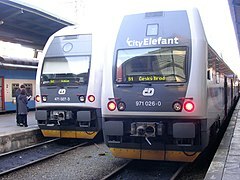 5 August 2001 [25 April 2010]. ^ The Holocaust in Bohemia and Moravia. Ushmm.org. [25 April 2010]. ^ The Virtual Jewish Library. [13 September 2014]. ^ "PM Fischer visits Israel". Radio Prague. 22 July 2009. ^ The World Factbook – Central Intelligence Agency. Cia.gov. [2016-12-10]. ^ Population change – year 2015 | CZSO. Czso.cz. [2016-12-10]. ^ The World Factbook. Cia.gov. [14 May 2014]. ^ "Press: Number of foreigners in ČR up ten times since 1989". Prague Monitor. 11 November 2009. 互联网档案馆的存檔，存档日期28 December 2014. ^ O'Connor, Coilin. Is the Czech Republic's Vietnamese community finally starting to feel at home?. Czech Radio. 29 May 2007 [1 February 2008]. ^ Crisis Strands Vietnamese Workers in a Czech Limbo. [13 September 2014]. ^ "Foreigners working in the Czech Republic". [2009-06-03]. （原始内容存档于3 June 2009）. . Ministry of Foreign Affairs. July 2006. ^ Czechs and Bohemians 互联网档案馆的存檔，存档日期4 March 2016.. Encyclopedia of Chicago. ^ Czech and Slovak roots in Vienna. wieninternational.at. [13 September 2014]. （原始内容存档于2014年5月12日）. ^ Total ancestry reported. U.S. Census Bureau. [13 July 2014]. ^ The Czechoslovak Hussite Church contains mixed Protestant, Catholic, Eastern Orthodox and national elements. Classifying it as either one is disputable. For more details and dispute about this, see Czechoslovak Hussite Church. ^ Promotion Strategy of the Czech Republic in 2004 - 2010. Czech Tourism. [2006-12-19]. （原始内容存档于2005-09-06）. ^ Czech sights. Discover Czech. [2006-12-19]. ^ Transport infrastructure at regional level – Statistics explained. Epp.eurostat.ec.europa.eu. [25 April 2010]. ^ Railway Network in the Czech Republic. SZDC.cz. [9 November 2010]. ^ （捷克文） Roads and Motorways in the Czech Republic. RSD.cz (2009). ^ Czech Motorways > Homepage. Motorway.cz. 22 December 2015 [2016-12-10]. Chief of State and Cabinet Members. Czech Republic at UCB Libraries GovPubs.